Telekom Malaysia Berhad (TM) unveiled its ‘TM Sejahtera Malaysia’ to mark Malaysia’s National Day – an innovative campaign that celebrates Malaysia’s diverse cultures by combining six different languages and two films together to create one unique experience. 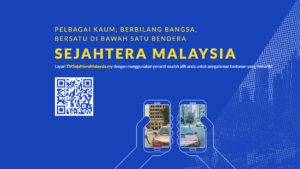 Created by Grey Malaysia, the campaign is centred around the song ‘Sejahtera Malaysia’ which was re-recorded in six different ethnic languages, with each line of the song sung in a different language. The song forms the soundtrack to two separate films, made for mobile phones and shot in vertical format, that uniquely combine when two mobile phones are put together, as depicted below. Each film stands on its own, but have unique visual elements that interconnect when played together side by side. The films show the lives of disparate individuals crossing paths by accident, colliding by circumstance, and united by the one thing they have in common: a celebration of being Malaysian. To see the full picture and how the two journeys are connected, viewers simply have to join their phones and hit the “play” button at the same time. The beloved classic song is given a fresh contemporary sound by Malaysian musician and composer Hady Afro. Aside from the original Bahasa Malaysia, the lyrics were sung in Mandarin, Tamil, Jaku Iban, Dusun Kadazan and English; alternating one after another before coming together in an uplifting chorus. Malaysians can also enjoy the tracks in their individual languages as six different versions, together with the two films in its full form starting 27 August 2018.